You have to pass the ICBB exam to receive the certification from IASSC. To increase the effectiveness of your study and make you familiar with the actual exam pattern, we have prepared this sample questions. 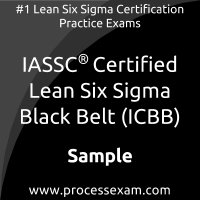 Our Sample IASSC IASSC Certified Lean Six Sigma Black Belt Practice Exam will give you more insight about both the type and the difficulty level of the questions on the IASSC ICBB exam. 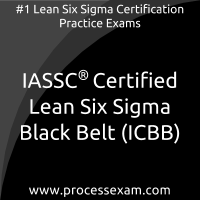 However, we are strongly recommending practice with our Premium IASSC Certified Lean Six Sigma Black Belt Practice Exam to achieve the best score in your actual IASSC ICBB Exam. The premium practice exam questions are more comprehensive, exam oriented, scenario-based and exact match of IASSC Certified Lean Six Sigma Black Belt exam questions.